Baking with Grace: Discover the Recipe for Ooh La La! (American Girl) | Your #1 Source for Kindle eBooks from the Amazon Kindle Store! Bake up a bakery business with help from Grace, our Girl of the Year 2015! 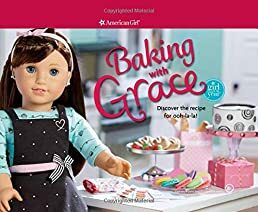 From making a doll-sized oven for baking pretend treats to setting up signs and putting together to-go boxes, dolls will have everything needed to create a Parisian-style shop. A paper chalkboard is perfect for displaying today's menu, and little paper doilies add an elegant touch. Includes: 32-page how-to book in English; doll-sized oven mitt; 2 patisserie bags; 2 bread bags; 1 paper chalkboard; 1 sheet of stickers for labeling and crafting; 5 sheets of paper for signs, ice cream cones, a newspaper, table tents, French flags, and doilies; 5 sheets of punch-outs for boxes, signs, doughnuts, crafting, doilies, and more!